Jules Robertson is a 24 year old actor with autism. He has recently graduated from Access All Areas’ and Royal Central School of Speech and Drama’s, Performance Making Diploma for Adults with learning disabilities. Jules has an extensive background in training and techniques most notably, the Foundation course in Global Theatre at the Regents University London in 2014; a summer workshop at The Roundhouse in 2012 where he won the “Jack Petchy” award for best actor and the Acting for Screen Course at City Lit College. Jules has a natural flair and energy as an actor and performer and is effortlessly engaging and watchable both on television and stage. He has worked on a handful of short films including Air is The Arrows which stars Sandi Toksvig and Rupert Holliday-Evans. Jules is the central character. He portrays a young man searching for happiness, without being altogether sure of what happiness is. He has acted in many theatre productions and appeared on a Horizon Documentary in 2014 for BBC 2, called Living with Asperger’s, where he talked candidly and honestly about his relationship with the condition. He is an articulate and intelligent young man who is as capable of making you laugh as making you cry. Most recently Jules has been cast as Jason Haynes, a wonderfully funny young man with Aspergers, on BBC’s Holby City. He is now a semi regular. Jules' career has been made possible through the hard work of Access All Areas, a charity that ensures artists with learning disabilities and autism are able to have the training and skills to work professionally within the performing arts industry. If you would like to see more diversity on stage and screen, please consider donating to Access All Areas. How did you feel when you found out you had received the role in Holby City? I was really apprehensive but tinged with pride that I had been given this great opportunity. I was nervous about the challenge and did not know whether I would enjoy it but I was determined to do my best. What is your character in Holby City like, can you describe him? Jason is really nice and sensitive with a deadpan sense of humour and a genuine desire to do good, although his Asperger’s condition does cause some problems for him and for those around him. For example he takes everything said to him literally and is sometimes confused by emotions. But he is a boy who needs love and really does love Serena, although he has difficulty expressing it. 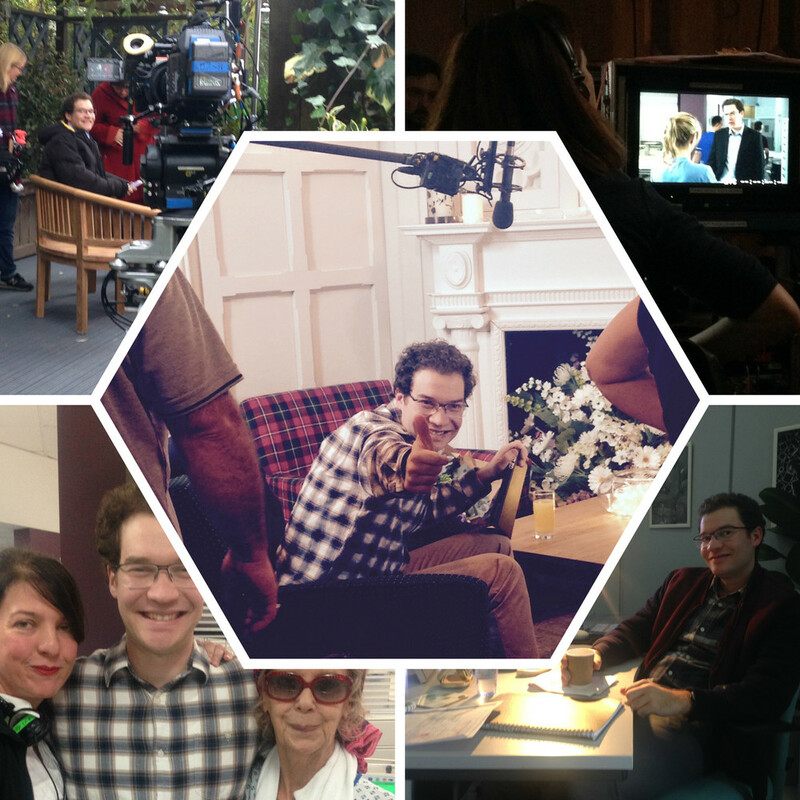 You’ve done some camera/ film work before, what is your typical day like working on Holby? Can you tell me about the other cast and crew members? I had done an acting course at Regents University and made some short films – in one of them, Sandi Toksvig played my shrink, which was fun. I voiced an animated film about how I overcame bullying at school. But Holby has been awesome, filming at the famous Elstree Studios is a highlight. I usually sleep until lunchtime, but now I jump out of bed at 6 am in the morning to be in make-up by 7:30 and that makes me feel alive. I banter with the lovely make-up ladies and then I’m on set talking and joking with the cast and crew and discussing how best to present Jason as a human character with the director before shooting. There’s lots of waiting around but it’s always enjoyable and I do have fun. Catherine Russell, who plays Serena Campbell is wonderful – she is such a good actress and has helped me enormously. We have become good friends. The crew members are great to joke with while we wait, and often I strike up a conversation with another actor or might pluck up the courage to offer my phone number to an extra. Holby really does have a brilliant cast. Your character, Jason, also has Asperger’s (/ASD). Why do you think it’s important that actors with Asperger’s play characters with Asperger’s instead of neuro-typical actors? Because I have had to fight this condition my whole life and I know just how hard it is, so I can bring that experience to the role. Ok, Dustin Hoffman was great as the Rain Man but I still think I can bring a special edge, something extra to a role like that. I think Hamlet was on the Autistic spectrum so maybe one day I will play the Asperger’s Hamlet. Jules Robertson as Jason Hayes in BBC Holby City. Photo credit: BBC Holby City Facebook page. You’ve worked with Access All Areas for a year now, what have been some highlights over this time when working or training with AAA? Well meeting and being directed by Nick has been great – he’s inspiring, then making a short film about Steve Martin – who is one of my obsessions, then the graduation ceremony, which made me really proud. Can you describe why you think it’s important for actors with ASD/ learning disabilities to have opportunities for training and performing on stage and screen? I think it’s important so that people with disabilities can have a voice, so we can get out there and show we can contribute to the acting profession as well as in other ways. How will people know of our capacities until they see us holding our own? Have you got any plans or ideas about what you will be doing in the future? I’d love to stay on Holby, and I’d like to join a theatre company and work through some stage plays in a regular cast. I don’t have a girlfriend at the moment so I’d love to play Romeo.